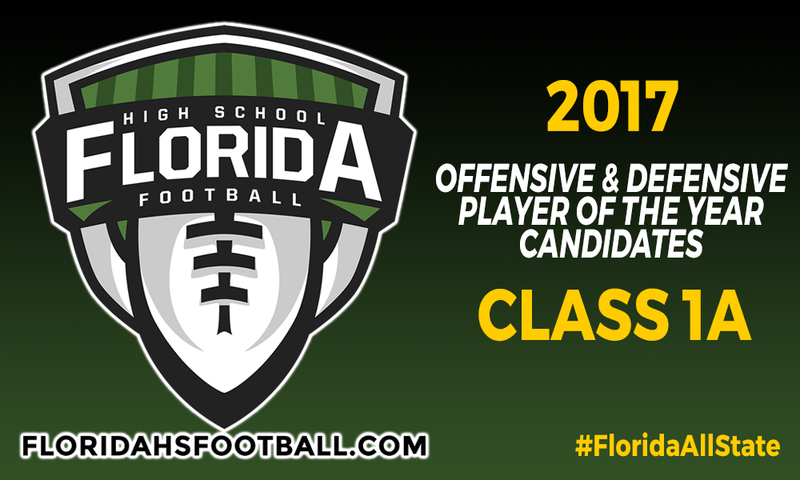 GAINESVILLE, Fla. — With the final step to fully closing the 2017 season is almost here, we are proud to reveal our candidates for our Class 1A Player of the Year candidates. For Coach of the Year, five coaches are selected as candidates based upon the resume they had for the season. For Player of the Year, three players are selected on offense and three on defense as candidates for Offensive Player of the Year and Defensive Player of the Year. One player from each classification of the six candidates total will be selected as the Overall Player of the Year for their respective classification. • RB/UT Derrick Staten Jr., Sr., Madison County – Racked up over 2,000 yards of offense as the leading rusher and receiver for Madison County, while scoring 31 touchdowns four different ways either through rushing, receiving, passing or kick and punt returning. • RB Kelvin Dean, Jr., Chipley – Lead Class 1A in total rushing yards and total rushing touchdowns with 1,836 yards and 26 touchdowns respectively. • WR Da’Shon Davis, Jr., Monticello Jefferson County – Lead Class 1A in receiving yards with 919 yards on 50 receptions and scoring 10 touchdowns. • DB Travis Jay, Sr., Madison County – One of the heart and souls of the Cowboys defense, he led the team in interceptions with eight while collecting 59 tackles and four pass breakups. • DL La’Tarie Kinsler, So., Pahokee – Led Class 1A defensive lineman for most sacks with 12 while collecting up 60 tackles and forcing two fumbles. • LB Zach Brown, Sr., Baker – Leader of the defense for state semifinalist team collecting 108 tackles, eight TFL, five sacks, seven QB hurries and recovering two fumbles.